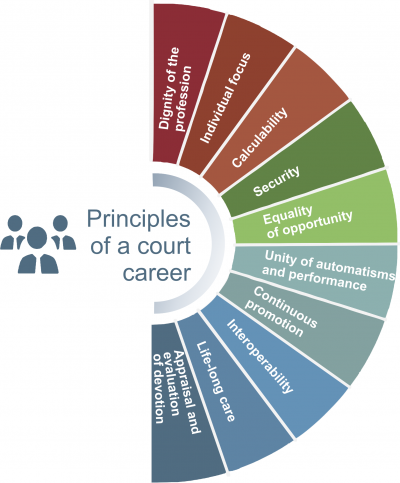 The Career Model provides a complex scheme to make the judiciary an attractive place for staff to work, thus promoting the labour market and job maintenace potential of the judiciary. The wide range of measures of career preservation provide judges, court secretaries, court drafters and employees of the Ministry of Justice opportunities whereby more recognition, professional promotion and renumeration is provided to the members of the judiciary as compared to other employees in the labour market. The Career Model has its focus on recognition both in terms of salary and profession, with a focus on maintaining work-life balance, and a marked emphasis on the development of community. Over the past years, a number of measures were taken with a view to the development of the Career Model. The National Authority for the Judiciary commenced the Jablonszky Scheme in 2014, to faciliate a marked improvement of labour conditions. The Chairman of OHB created the Expert Panel for the Career in Judiciary in 2015, marking the commencement of the career model for the judiciary. At the recommendation of the Chairman of OBH, wages were increased to drafters and secretaries in 2015. The Chairman of OBH commenced the Retention Scheme in 2015. The purpose of the program is to express authority’s commitment to retain staff members. In addition to emhasizing their commitment, the scheme also addresses social difficulties, in addition to recognising public service status and performance. The scheme is funded from budgetary savings from effective operations, and the available budgetary surplus, which is always distributed along uniform principles. In 2017, the Hungarian Parliament made a law on the public service status of staff of the Ministry of Justice, which involved a considerable increase of wages for these employees. The Digital Court project brings a modern technology to ease the workload in all courts in the country. The process of judicial wage increases has reached its last phase, with considerable outcomes to be expected to occur as from 1 January 2020.